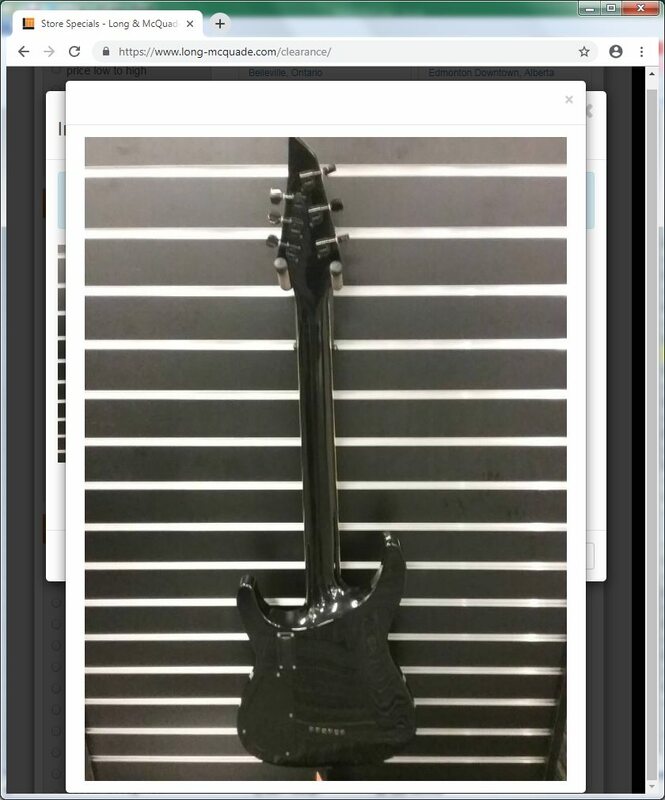 This morning, I noticed a 2006 SLSMG on the Clearance section of the Long & McQuade retail website. It was listed for CAD$299 (USD$223.79) in a store branch in another city across my province. I phoned my local store branch as soon as they opened, asked them a few questions about the guitar that they could pass on to the other branch, got my answers, and placed a $50 deposit + $10 shipping to secure the transaction. 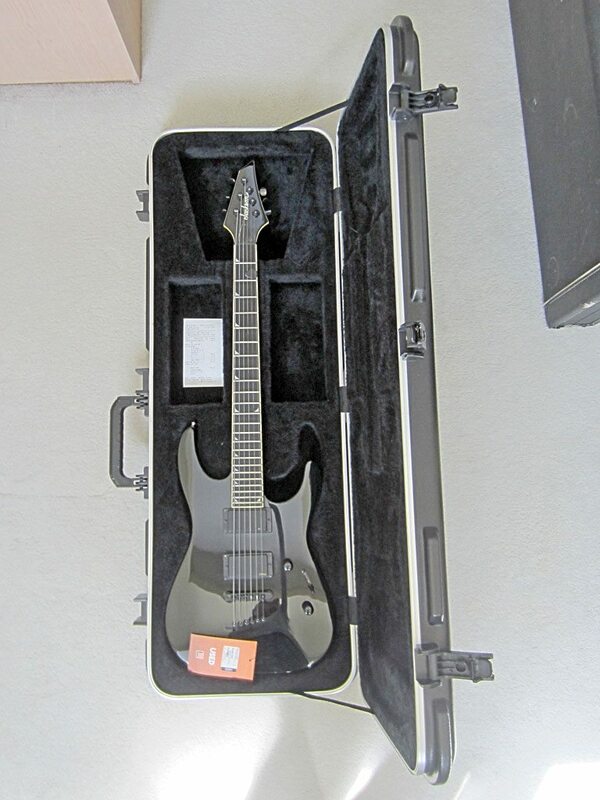 Hope to receive the guitar at some point next week. Serial number 060099 suggests 2006 build. 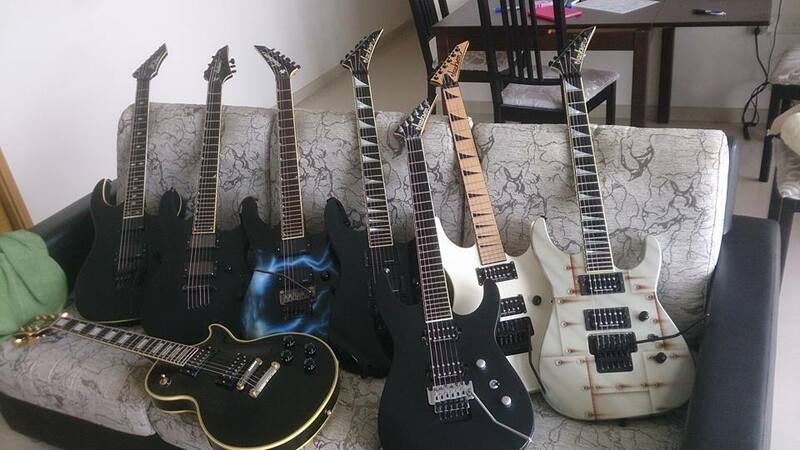 First year that the MG Series guitars received active EMGs. I have an empty "SOLOIST/DINKY CASE - SKB 2996100506" that would be perfect for this SLSMG (which doesn't come with a case). Two years ago I missed a similarly priced "Deal Alert" SLSMG (https://www.jcfonline.com/threads/15...LSMG-(CAD-300)) in another city. Glad to have one at long last. Pics from the store are below. I'll take my own photos at a later date. What the pics don't show is the minor rash and a tiny bit of the headstock tip missing from the back of the headstock that was described to me over the phone. I can live with those flaws and take a chance ordering the guitar whose bones are otherwise solid. Besides those blemishes, apparently the guitar is fine. Nice score with real EMGs! Congrats! Great deal on that one. 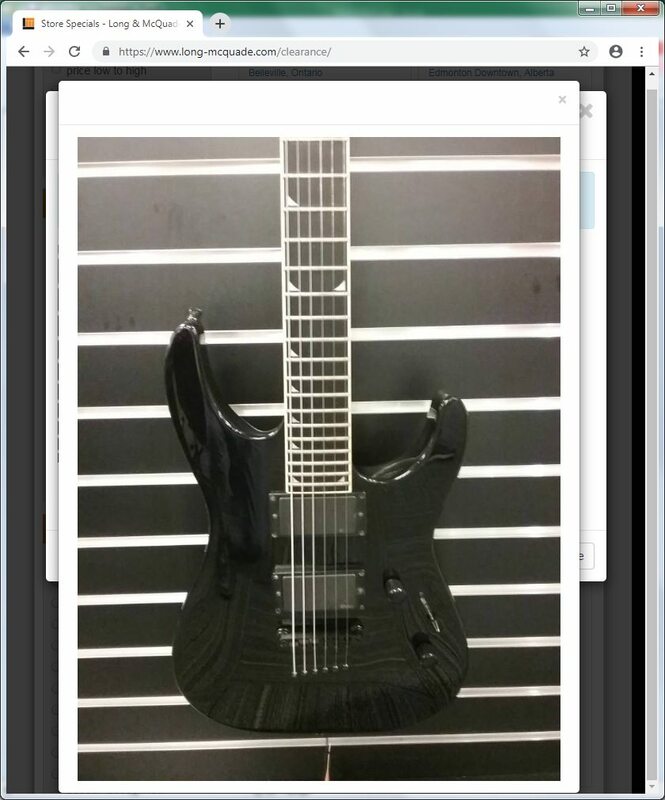 I can definitely get over the head stock shape for that kind of spec'd MIJ Jackson at that price. 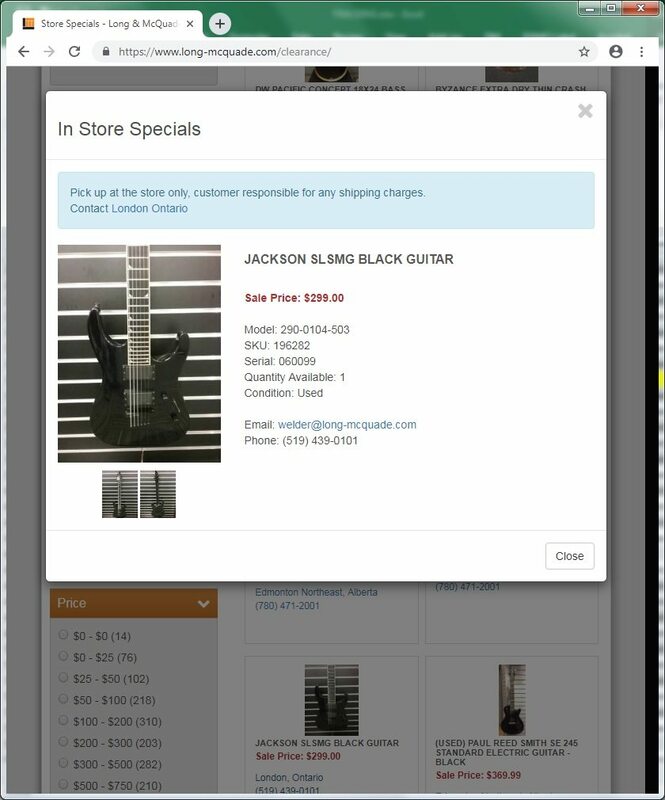 That's a helluva lot of guitar for that price. Thanks everyone. I finally brought the SLSMG home today and gave it an initial play and superficial inspection. Amazing tone and killer sustain. Whoever owned this guitar before me had the good sense to swap the EMG-85 into the bridge and the EMG-81 into the neck, which I prefer anyway. Playability is surprisingly good even with high action, minor fret wear, crusty frets, and imprecise intonation. It's going to be a beast after I clean everything and set it up properly. 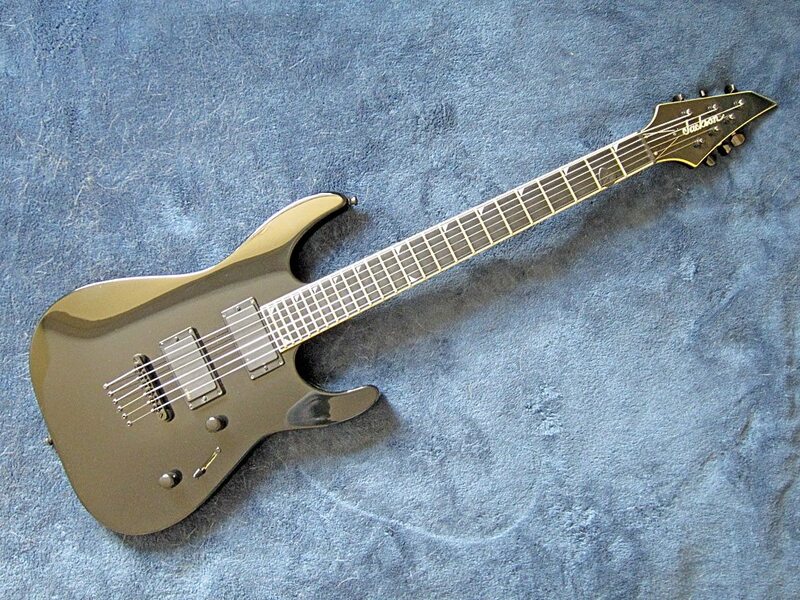 Immediately comfortable, familiar-feeling, and addictive neck/fretboard. I finally have a guitar that is suitable for the empty "SOLOIST/DINKY CASE - SKB 2996100506" I picked up in November 2017 year for CAD$60. Cons... all related to the nut! See photos below. 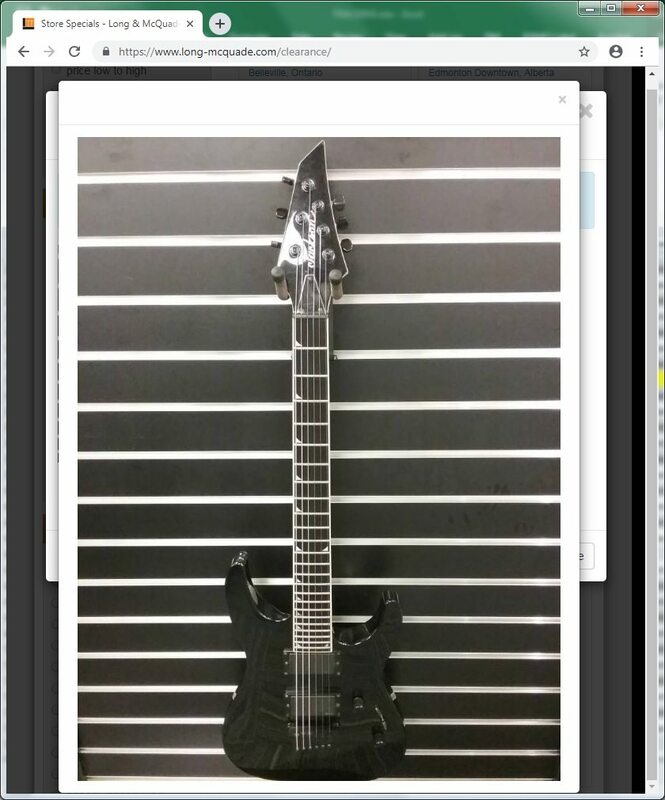 For CAD$299 for an otherwise killer guitar, I probably shouldn't complain too much. There are some clearcoat cracks on both sides of the nut. The store did not disclose this to me over the phone last week, and I only noticed these cracks after I paid and got home. It's structurally solid so I can't tell if it's sloppy work by Chushin Gakki or if the previous owner did it somehow. There is clearcoat on either side of the nut! Wouldn't you spray clearcoat to the guitar, then install the nut afterwards? If I wanted to remove and replace the nut, it feels like I would risk lifting the surrounding clearcoat, a scary proposition. Last edited by Number Of The Priest; 04-06-2019 at 01:58 PM. Both of my model 5's have clear over the nut on the sides. Must just be a Chushin thing. As far as that diagram goes... 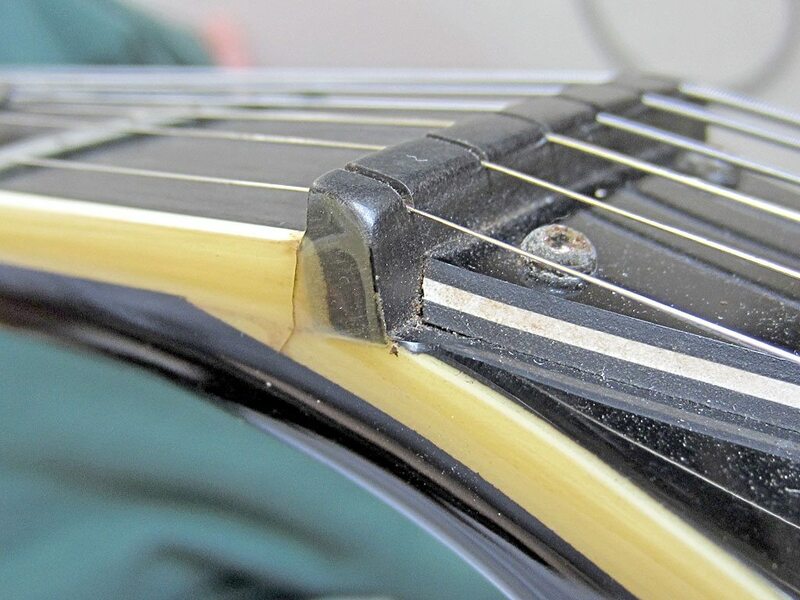 I was talking to a very competent tech and he told me it does not matter how high the nut is (strings sitting inside the nut, like this guitar) if it is cut properly. 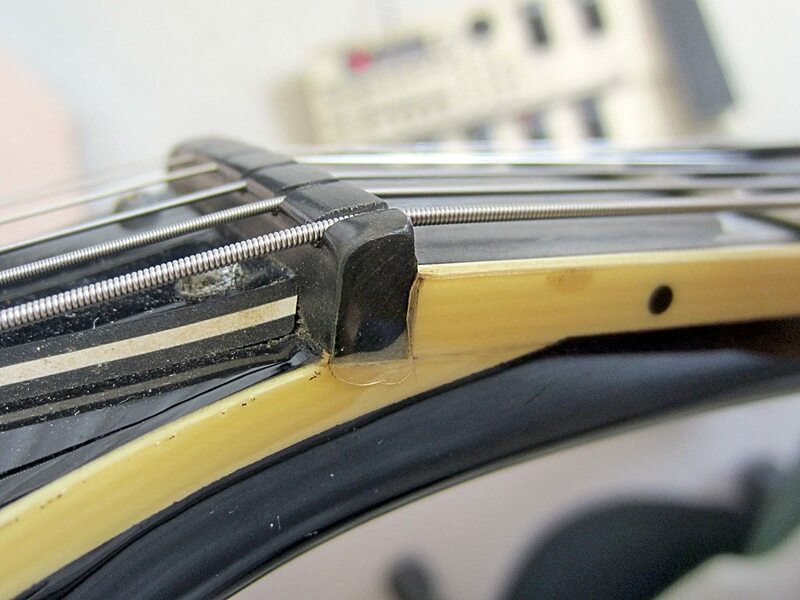 It is more aesthetically pleasing to have the strings sit on top of the nut, but truly does not make a difference. Truly an amazing deal even with those minor flaws. The cracks look to be surface only. Your camera (or phone these days...) does a great job! 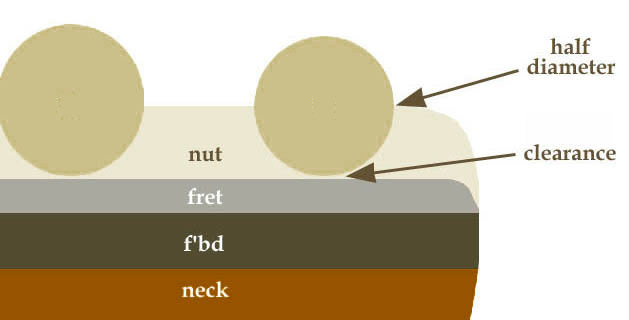 I just checked some of my other non-locknut guitars (Charvel Model 1C, Schecter C1) and the height of those nuts are more moderate, with shallower nut slots, and thus better approximate that cross-section diagram above. Hence why the SLSMG nut surprised me. But you're right, the quality of the cuts of the slots matters. They must be cut well enough on the SLSMG because, fortunately, the strings don't bind in the nut slots. Also, the clearcoat on the sides of the nuts of those other guitars isn't heavily caked on like they are on the SLSMG. For those nut closeups, the camera is a 2011 Canon PowerShot ELPH 300 HS set on macro mode, with some corrections (levels, shadows, cropping, and unsharp mask) performed in 2010 Adobe Photoshop CS5. I'm so behind the times. I'll take proper DSLR pics when it warms up outside. We still have snow on the ground here. Forgot to mention another positive about the guitar... pinch harmonics fly off the fretboard with ease. This guitar squeals like a stuck pig! Last edited by Number Of The Priest; 04-07-2019 at 10:39 AM. Schwing! 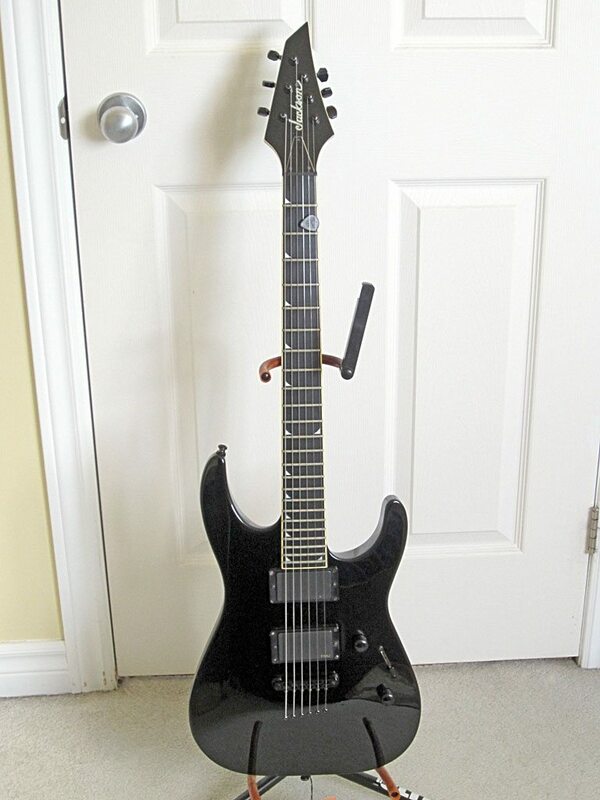 Very nice guitar and for a great price! I’ve seen one of these stripped, and it was ribbon mahogany, possibly african, but definitely not luan or nato substitutes. The ebony boards on mine are tight grained and have that graphite look as compared to the newer indo pro models that have a bit more grain. For what they are, the SLSMG must be one of the most underrated guitar of all time lol. The nut slots on yours are a bit deeper, on mine, the low E is poking out a bit, A is flush, D-E are inside. I haven’t had any tuning issues. Did you get my message, NOTP? I emptied my inbox for the first time since 2013 , so I wasn't sure if I deleted your message before you got it. I've grown to love piranhas on ebony. BTW, my SL2HT has clear coat over the nut. It's evidently really well done because I had to look close to notice the nut had the same continuous shine/finish as the neck. You and I were fortunate to get some great-priced SLSMGs recently. Like you, I would not hesitate to add a second one to my arsenal at the right price. Makes me wonder why there's this inconsistency with nuts! The plot thickens. I did, thank you! And I remember I replied to it, asking about the seeming non-existence of black bone nuts, but my Sent box has no record of it! Very weird. I like it too. The size of the piranha inlays makes it "less obvious" that they are not real mother of pearl. I'm actually OK with that. With full-sized sharkfin inlays in plastic, it's very obvious they are not mother of pearl.